During his lifetime, the Berlin-born Hugo Kaun enjoyed considerable success as a composer and as an esteemed choir director - though in Milwaukee, Wisconsin, far from the capitals of European music culture. The Berolina Ensemble is now initiating his long-overdue rediscovery. His Octet, Piano Quintet and String Quintet No.1 display an independent character skilfully bringing together the traditions of German romantic music to form a very original expressive style. Despite all his triumphs in America, Kaun returned to his native Germany in 1902 and initially had to cope with many a disappointing setback. It was only gradually that he obtained success, and with time his oratorio oeuvre in particular gained great popularity. Kaun's chamber music composed in America evidently also met with recognition from his great models. 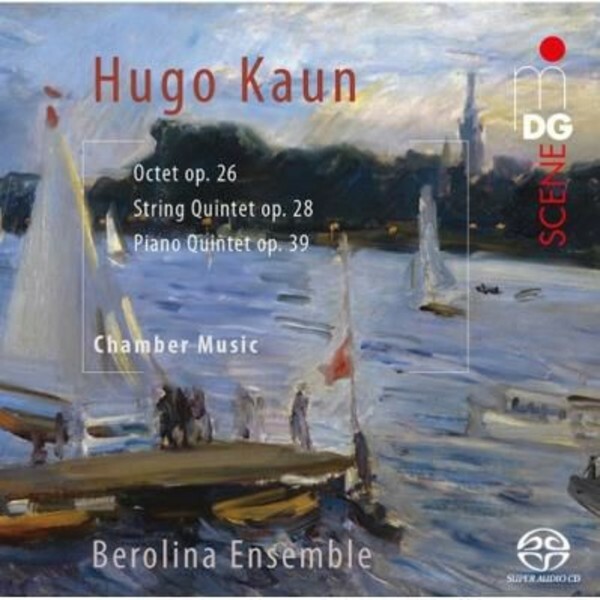 It was not without visible pride that Kaun mentioned in a letter that the great Johannes Brahms himself had expressed great praise for his String Quintet No.1 - very justly so, as the Berolina Ensemble impressively demonstrates.